Of all the vegetables/fruits he has had since ....carrots, beans, peas, potatoes, spinach, parsnips, radish, cauliflower, broccoli, courgettes,tomatoes, sweet potatoes, strawberries, cranberries, apples, pears, papaya, avocado...(name it he has had it).....he still loves the banana, and has one everyday. Hence our house always has an abundant supply of bananas. Well having said that there are occasions wherein a few bananas always turn spare hence i have the task of finding innovative ways to utilise them. Apart from the mangalore bun, banana loaf, milk shakes, ghariyos, this simple and tasty cake is a winner. I found this recipe by Rhonda J at Food.com it has had many good reviews so decided to try it out. 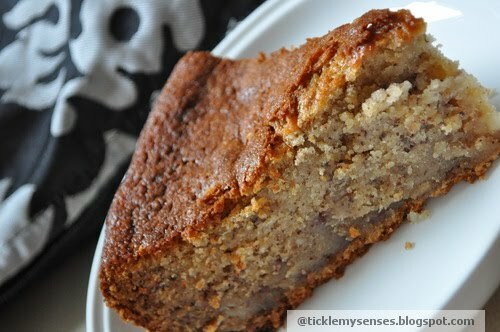 Its supermoist and light texture is filled with banana goodness. Should be tried. Can make a treat in tiffin boxes or for tea time. I added some cinnamon powder and a few cashewnuts to the cake batter to give a bite to the cake and improve its nutritional value. Food Fact: Bananas also known as the ‘Poor Man’s Fruit’ falls into the category of healthy foods. Needs no cleaning, cooking, available cheap and is ready to eat. Full of vitamins like vitamin A and C and a large number of vitamins from the B group, including thiamin, riboflavin, niacin and B6, as well as traces of folic acid. Vit B6 essential in the production of hemoglobin which keeps you from being anemic as well as white blood corpuscles which are part of your immunity system and help you fight diseases. It is also crucial in maintaining proper blood sugar levels by helping convert carbohydrates into glucose. Bananas are also a great source of potassium. Potassium is a vital ingredient in ensuring the proper functioning of muscles. This means potassium is essential for the proper functioning of your heart. Bananas are also very rich sources of carbohydrates and fibers. Fibers improve our digestive system and ensure that we get the most nutrients from the food we eat. A single banana is adequate to fulfill 16% of our daily fiber requirement ( helps to make baby poo time stress free ;)) Bananas also contain manganese and magnesium among other minerals that are part of our daily dietary requirement. Cashewnuts are a good source of iron and zinc with good fats having zero percent cholesterol, also contains selenium an antioxidant known to fight cancer. Cashew nuts have a high energy density and high amount of dietary fiber, both which have been attributed to a beneficial effect on weight management, but only when eaten in moderation. 2. Grease and flour a 9 x 13 pan. 6. Beat in eggs, one at a time, then stir in 2 tsp vanilla. 7.Beat in the flour mixture alternately with the buttermilk. 9. Pour batter into prepared pan and bake in preheated oven for one hour or until toothpick inserted in center comes out clean. 10. Remove from oven and place directly into the freezer for 45 minutes. This will make the cake very moist. 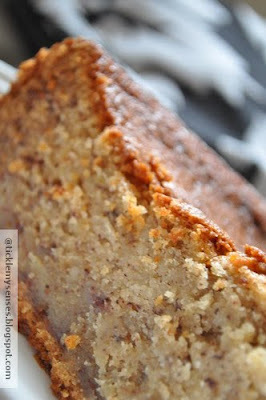 Hi carol, I m your sister s friend from Bangalore. . :) tried the banana cake and it was yummm!! Trying your hot and sour egg curry tonight!! Warm welcome to Tickle My Senses. I'm so happy you enjoyed the Banana cake :) I hope you enjoy the Hot and Sour Egg Curry too. Look forward to your feedback! !